Ironwoman Charlotte Best ran her first ever multi-stage marathon in 2014, and decided to do it in heats of up to 33 degrees celsius across the Oman desert. This is her account of the adventure, and a few tips for those of us thinking of making a multi-stage marathon much, much harder by doing it in a desert. I moved out to live in Oman in September 2013, after deciding that eternal sunshine was preferable to the eternal rain that seemed to be a permanent fixture of life in Stockport. My boyfriend was already working and living out there, so I decided it was time for a change, despite not having a job lined up. I’d done quite a lot of running in 2012 whilst training for my first Ironman (which was my first marathon) and through the 2012/13 winter with some coastal half marathons and a spring coastal trail marathon. After the coastal marathon I was out injured with ITB problems which took me a long time to recover from and get back to running. It wasn’t really until I moved to Oman that I started running again with any kind of regularity and with no pain! I joined the local running club (Muscat Road Runners) and started doing the club winter and summer series races, with Muscat Half Marathon in the January of 2014.A good friend of mine was planning on doing some travelling in the summer of 2014, culminating in running the Jungle Marathon in Brazil; she said did I want to go and run it with her? Obviously the answer was yes, but the logistics (and finances) ruled it out pretty quickly. After that I decided that I wanted to do a multi-day running event too, so I started looking around for something a little closer to home. 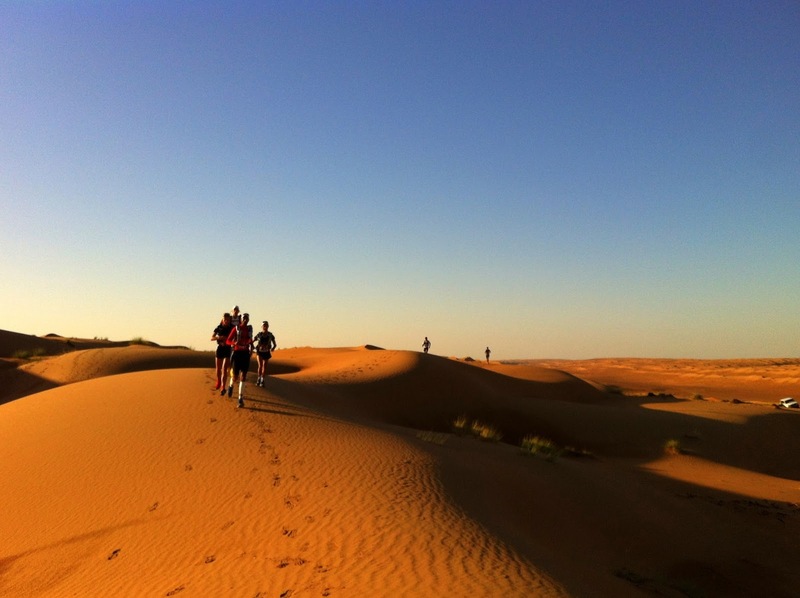 The Oman Desert Marathon (165km in 6 self-sufficient stages across the Oman Desert) ticked all the boxes; it was local to my part of the world (even better, it was in-country! ), it wasn’t extortionately expensive and the daily distances (and time cut-offs) looked very do-able for a first timer at this sort of thing. So I entered before I had a chance to change my mind. The race was the second week of November; this is really when the temperature usually starts to cool down for the winter. Obviously November 2014 was particularly hot for the first week and a half (just like England, sometimes the weather just does not play ball), with daily temperatures ranging between 28 – 33 degrees with overnight lows of 19 – 20 degrees. I had the added advantage over some people of having spent the summer training in Oman – doing 20km+ runs with a weighted backpack in 35-40 degree heat and upwards of 70% humidity. By the time we got round to November, the weather seemed really quite pleasant to me, although a lot of the runners who had come over from Europe really suffered with how hot it was on the first day. My training wasn’t too different from normal marathon training, other than adding the occasional extra run into my weekly plan, normally the day before or after my long run, to get used to running on consecutive days. I did my first Whole30 (30 days of whole food, nothing processed or preserved, no additives, no gluten / dairy / sugar etc.) during August, so I’d had to be quite careful with my nutrition and so had got very used to doing my long runs with dried fruit and nuts as energy food, with water and Elete salt solution for hydration. I’ve never liked the very sugary sports gels and drinks anyway, so having a simple salt solution that I could add to plain water worked perfectly for me. I wasn’t too concerned about finishing the race; I was fairly convinced that even if I had to walk large sections of it I’d be able to finish within the time limits. My main concerns were not getting lost on any of the stages, and getting through the week with no injuries, more specifically getting my feet through the week with no injuries. I’d decided to forego my offroad shoes in favour of using my road shoes that I spend the majority of time training in, as I knew they wouldn’t give me blisters. The only trouble I’d had whilst training over the summer was extreme heat and sweat rash (imagine nappy rash over all t-shirt and short areas! ), with patches on my sides that had been rubbed raw by wearing a weighted rucksack – even liberal amounts of Bodyglide don’t help when you sweat that much! The group of people running was a really nice bunch, with people from the UK, France, Germany, Belgium, Jordan, Morocco, Oman, Poland, Italy, Syria, Uruguay, Spain, Ukraine and Taiwan. Most days I’d run with other people for the first 6 or 7km, before settling into my pace; a lot of the times after that I ran on my own. Often in sight of other people, which was reassuring, particularly during the marathon stage, where I ran with (and then tried to keep up with!) my Muscat Road Runners buddy Hamood. There were 36 of us that ran the whole thing, with although only 9 ladies running in total, was more than I had initially expected. I absolutely loved the entire experience – the course was really well marked so it meant I could relax a little bit and just settle into the run. After the first day, I got settled into a routine of as soon as I’d finished, mixing a recovery shake, taking some extra rehydration salts and drinking at least 750ml within the first half an hour whilst I did my stretching. Then it was a case of napping, eating, napping again, stretching, having a bit of a wander, chatting and generally lazing around for the rest of the day before dinner and an early night! I’d love to do the race again – I’ll actually be in Oman this year during the race, but sadly I’ll be working and I don’t have the holiday time left to take time off! I’ve got several friends who are racing this year, I like to think I encouraged them that it was a good idea 😀 Hopefully I’ll make it back to do the race again in the next few years. I wouldn’t rule out running MDS – I love the idea of being able to say I’ve done it, but the extortionate cost and the huge number of people running does put me off. I think I’d be more likely to find a smaller, lower key race to do instead.After six days, Charlotte crossed the line in second place. Charlotte’s top tips for running a HOT marathon. Try to acclimatise to running in the heat. Whether this is a hot holiday somewhere in the months prior to the race, a heat chamber, sweat runs with loads of layers, or arriving in-country early for the race. Being used to the weather gave me a massive advantage over some other people. Don’t try anything new on race day! (An oldie but a goodie.) Hot weather exacerbates any rubbing from new clothes or shoes, new foods not settling well in tummies etc. and the key is to keep as comfortable as possible in every aspect that you can control. You probably won’t be comfortable in the heat, but you can’t control the heat! Wear the right kit. Lightweight shorts and t-shirts that wick well and don’t rub when wet. A good hat (with neck flap if you have short hair), a decent pair of gaiters (that you’ve tested in sand! ), and a good rucksack that is comfy when your clothes underneath it are soaked with sweat.